The dresser turned out great and I especially love the mirror too. Your tulips are gorgeous! Love & blessings from NC! Looks just beautiful in your living room along with the pretty bottles and tulips! You always find such great stuff for amazing prices! Wow!! It's fantastic. 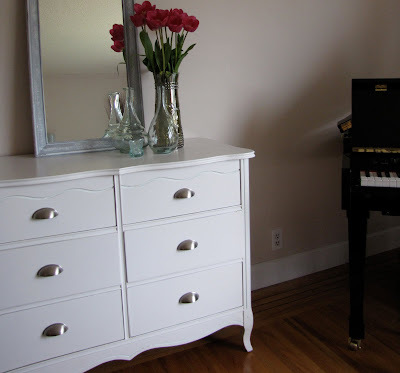 I'd love to have a dresser like that. You did well to put in your room and not leaving in the garage.... It looks great!!! Oh I love it Tracey! 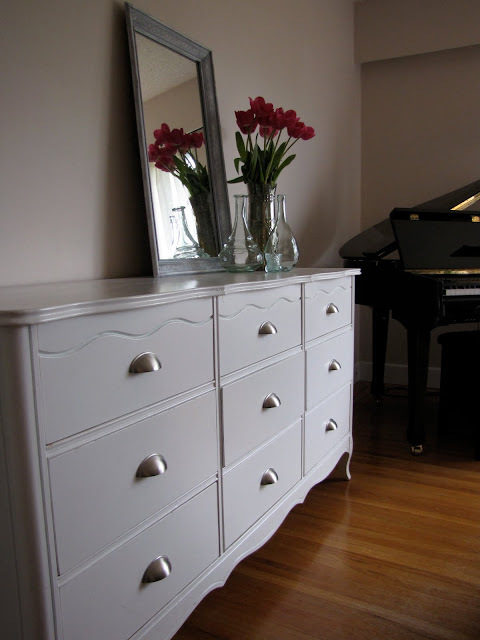 Your dresser looks gorgeous and I love the colour of your mirror makeover................thanks for sharing it !! love it. I don't think it crowds the room at all..or at least the pictures don't make it look like it does. Crowded? Not at all! looks absolutely lovely to me! You did a brilliant job, that dresser is fab! 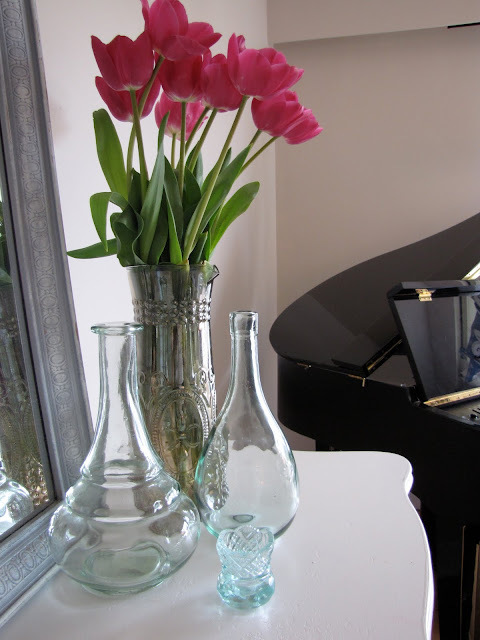 Love the tulips in the glass decanters too ..ok to make it simpler: I love everything! Tracey - it looks amazing! I could really use something exactly like this in my living room!! And for $8...!!! Your thrift shop sounds like a dream!! Also I love the decanters & the mirror - all look perfect together! 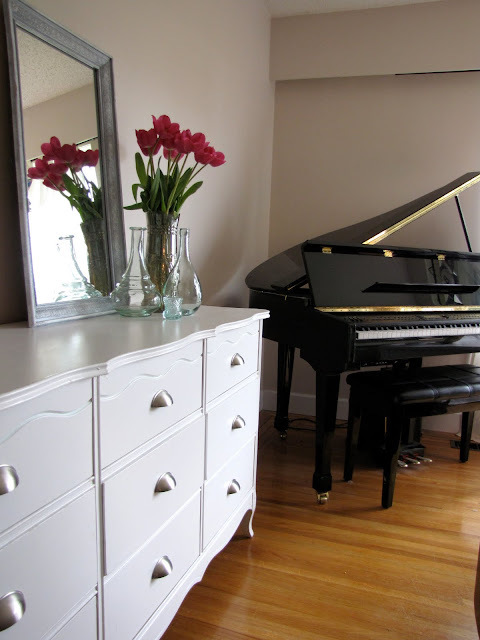 I think the dresser looks great in your living room, the piano add a touch of class as well. Still am envious of you finds at the thrift store! Love the dresser and the mirror, that blue/gray color is perfect!! Oh that is very cute! what kind of paint did you use? So pretty! I love your photos. Your dresser and mirror are fantastic! Tulips are my fav and your pics are so pretty. I'm totally jealous, and I WANT that mirror. LOL. I just love your style, you totally inspire me! Thanks for the sweet comment on my blog tonight. I have to agree with EVERYTHING you said. I just don't understand people like this! Mean girl, I guess. LOL. I told my hubby... uh... I just feel BAD for her. And it's almost like I want to be her friend. LOL... My hubby's response was... "ugh... you WOULD!... she's such a JERK!" To each their own... right? I love the dresser in that room. I think it has an elegant look with all the curves and the new pulls! 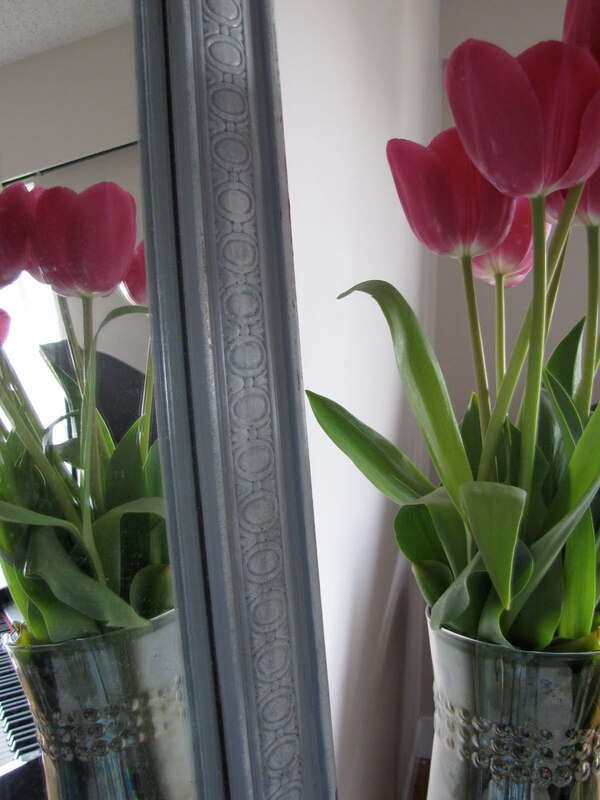 The mirror and tulips look great on it. Thanks for dropping by the other day, sorry it took so long for me to visit. What can I say, I'm still celebrating my b-day!! Hi Tracey, always so sweet and sober, white furniture. Your dresser is a beauty! So pretty, it was worth the wait, you did a fabulous job. Talk about a deal! My favorite flowers are tulips, they look gorgeous on your dresser, have a wonderful weekend! a real beauty! i think it looks fabulous there! I love the handles on the dresser and the colour of the mirror, nice work!! Tracy you do white right!~ I know I have told you this before, but I will say it again, you have great style and a great eye for design and decor! Have a great weekend! NOT crowded at all! Beautiful! Luv'n the hardware & the punch of colors with the fresh tulips! Bravo! The dresser looks terrific, Tracey... like a credenza in your living room :-) I wish you'd taken a before pic... it would have been great to see. The glass decanters were a fantastic find!